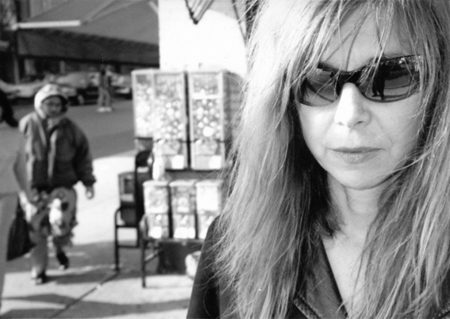 Acclaimed, independent filmmaker Sara Driver ’77 will be one of the featured guests for the 27th Annual Helen Clark Berlind Symposium October 20-21 at the Maier Museum of Art at Randolph College. Held in conjunction with the 107th Annual Exhibition of Contemporary Art, Zeitgeist: The Art Scene of Teenage Basquiat, the Berlind Symposium will include a special screening of the new film, Boom! for Real: The Teenage Years of Jean-Michel Basquiat. Driver, who directed the film, will make an introduction and lead a post-screening discussion. She will also moderate a panel discussion with artists who knew and worked with Jean-Michel Basquiat. See the complete schedule at www.maiermuseum.org/berlind. In addition, the Maier is hosting a series of film screenings held in conjunction with the Annual Exhibition. For more information and the complete schedule, visit http://maiermuseum.org/films/. How did the opportunity come about for you to direct Boom! For Real, and why did you want to do it? “After Hurricane Sandy hit New York City in late October 2012 and flooded the lower East Side of Manhattan, I went over to my friend Alexis Adler’s house for a tea and to see how she fared during the flooding. All her friends knew she lived with Jean-Michel Basquiat in late ‘70s. He painted a lovely mural on her bedroom wall as well as her bathroom door and refrigerator door. Alexis is scientist and had put away works he left for her in a safety deposit box over 30 years ago. The bank was in the flood zone. What was the process like in creating the film? What was one of the most challenging parts about directing the film? Alternatively, what was one of the most enjoyable parts of directing the film? How did you feel about the finished product, and what was it like seeing the premiere at the International Film Center in New York? “I don’t like the word ‘product’ for a film, although I guess that is what it is. It premiered at the Toronto International Film Festival. That is one of the most prestigious platforms for documentaries. They only accept 12 or 15 internationally. And where your film premieres is similar to where your child goes to college. That dictates the film’s theatrical life and world sales. The film was picked up by one of the very best world sales agents, and is now opening all over the world. What does it mean to you to now have Boom! for Real as part of the exhibition at the Maier? “I have always admired the incredible collection of art at R-MWC or Randolph College. The Maier always fascinated me by its Cold War association with the National Portrait Gallery in D.C.
“Boom! for Real instigated the art exhibit, Zeitgeist: The Art Scene of Teenage Basquiat. I went to Howl Happenings, a gallery in the East Village in NYC, and asked if they could do an exhibit in conjunction with the opening of the film at IFC in May. One of the heads of the gallery said to me definitively, ‘We are booked till 2020.’ I showed them the list of artists who would be in the show and who had given me material for the film. After reviewing the list a few days later, I got a call. They had an opening in the gallery in May. They had a cancellation. The dates worked perfectly for the NYC premiere of the film. Martha Johnson from the Maier Museum came up for the festivities and opening. She began to formulate a plan with the two heads of Howl Happenings, Ted Riederer and Jane Friedman (Jane is a legend in the history of rock and roll. She represented Jimi Hendrix and managed Patti Smith). What’s some of the feedback you’ve gotten about the film so far? What are you looking forward to most about the upcoming Berlind Symposium? What advice would you give to Randolph students who are considering a career in filmmaking? How did your own experience at R-MWC prepare you for your career? The screening of Boom for Real is sponsored by The Sara Driver ’77 Digital Filmmaking and Lecture Fund, established through the generosity of Albert W. and Martha Lou Driver ’50. The 107th Annual Exhibition is supported by the generosity of Mary Gray Shockey ’69. The 27th Annual Helen Clark Berlind Symposium is supported by the Helen Clark Berlind Symposium Fund, as well as Maier Members Julie Johnson McGowen ’69, Barbara Niedland McCarthy ’73, and Dana Davidson Redmond ’60. Zeitgeist: The Art Scene of Teenage Basquiat was curated by Sara Driver ‘77, Carlo McCormick, Mary-Ann Monforton, and Howl! Happening, An Arturo Vega Project with Jane Friedman and Ted Riederer.